Wouldn't it be wonderful to find a plant that exhibits not only handsome foliage and attractive flowers, but also eye-catching fall color and showy seed heads that enhance its charm and appeal for several months of the year? Welcome to the world of ornamental grasses. These versatile plants come in all sizes, from ground covers to shrub-sized clumps, and in many forms, from upright tufts and arching fountains to mop-top mounds. The plants range from just a few inches to more than 20 feet in height and width. Grasses readily adapt to the same environmental conditions in which most of the other ornamental plants in our Mediterranean climate gardens thrive. 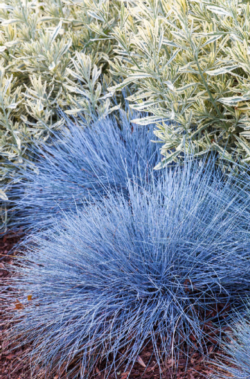 In short, ornamental grasses add movement, texture and a vibrant color palette to any garden. The term grass has become a convenient way to identify a range of plants that bear narrow and straplike leaves. Grasses vary widely in height, habit and color, but they all have similar foliage textures. This class of plants includes true grasses (Poaceae family), sedges (Cyperaceae family), rushes (Juncaceae family) and cattails (Typhaceae family). True grasses include lawn grasses, cereal grains, ornamental grasses and bamboo. Sedges (the Carex genus) and rushes are grasslike herbs that spread out in damp habitats on creeping rhizomes. You may recall the old garden rhyme, "sedges have edges and rushes are round: grasses are hollow and rush all around." By using this little ditty, you may be better able to distinguish the various types of plants described as grass. Grasses depend on wind, not insects, to carry their pollen from flower to flower, so they don't need to produce colorful blooms to attract pollinators. Instead, they develop clusters of tiny flowers in shades of green, yellow, brown, pink, maroon or silver that turn to more subtle colors such as tan, brown, gray or gold as these clusters age. Many have a silky or bristly appearance because of needlelike awns that extend out beyond the blooms. Blue grama, dune sedge or red fescue readily substitute as low-maintenance ground covers or as lawn alternatives. Grasses also do a great job of softening hardscapes such as walls, boulders, paved driveways and steps. Choose the grasses best adapted to your microclimate, site and needs. Study plant catalogs, visit gardens in your community and local nurseries that feature grasses to learn which ones do well in your microclimate. Most grasses do best in full sun, but some grasses grow equally well with less light. Notably a native grass, Festuca californica, thrives under trees. 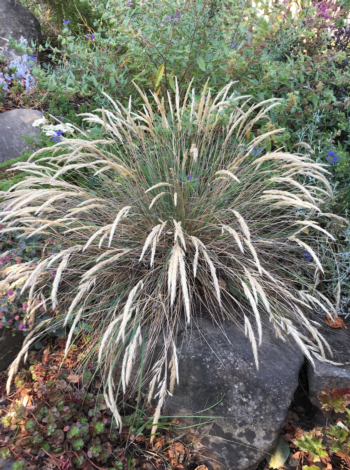 Variegated grasses often produce their best color in light shade. Because they develop an extensive root system, many grasses are drought tolerant. However, it is important to know when selecting grasses that some species require a steady supply of water to maintain their health. Grasses are typically divided into warm season or cool season varieties based on the six months during the year when they are actively growing. Plant warm season grasses such as Bouteloua gracilis and Muhlenbergia rigens in inland regions in early spring so plants can put down a good root system and be ready to shine when temperatures rise. Plant popular cool weather grasses Calamagrostis foliosa, Calamagrostis nutkaensis, Deschampsia caespitosa, Festuca californica, Festuca idahoensis, Festuca rubra in moderate climate coastal plant communities any time, although early spring usually works best. Before digging the hole to plant a grass, loosen the soil and pull up any weeds near the site. Avoid adding any rich manure or fertilizer, as grasses don't thrive in rich soil. Mulch with 1 to 2 inches of compost each year. Water grasses regularly during their first year to help establish a good root system. Evidence from the 1991 Oakland fire indicates that grasses that are watered and maintained as other landscape plants are less vulnerable to fire damage. Grasses aren't bothered as much with pests and diseases as other plants making maintenance less of a problem. Take photos of grasses you find attractive, do a bit of online research or visit your local garden center to learn more about the growing habit of the specific grass you have selected, and add some attractive interest to your landscape.